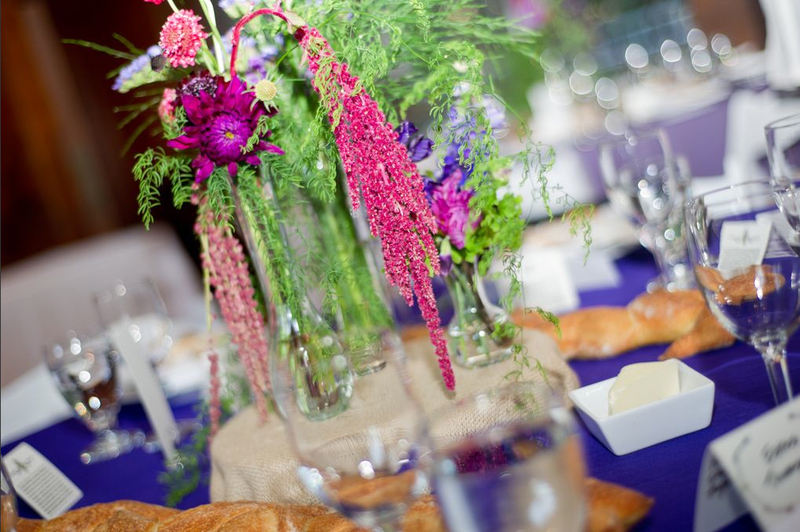 Just a little wild and colorful wedding at the UC Botanical Garden and Brazil Room. 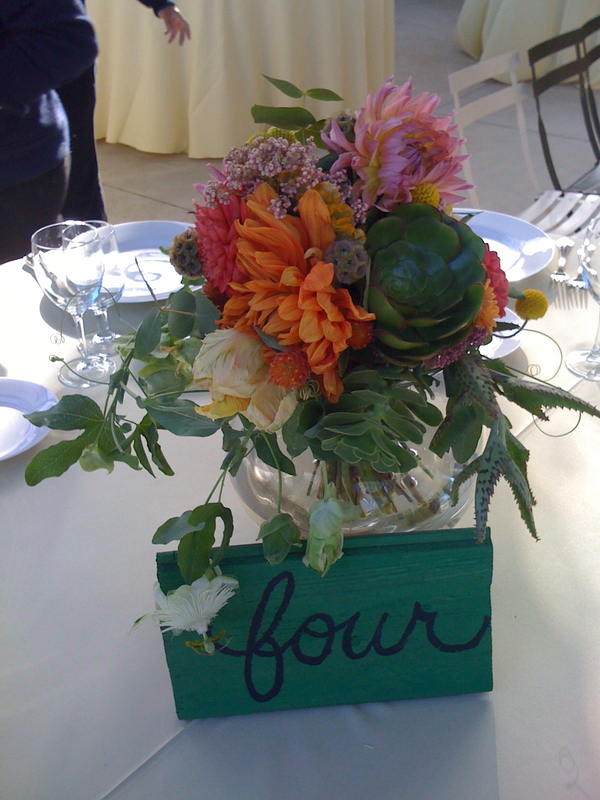 This summer I provided some floral pieces for a local wedding using local and organically grown flowers and blooms. Here is a picture of the beautiful bridal bouquet featuring local/organic grevillia from Oakland, local dahlias and local garden roses in peaches, coral, gold and brown tones. Romantic, interesting textures and beautiful! A few months ago I ventured to Boise, Idaho for a memorial service for a special member of my husband's family. 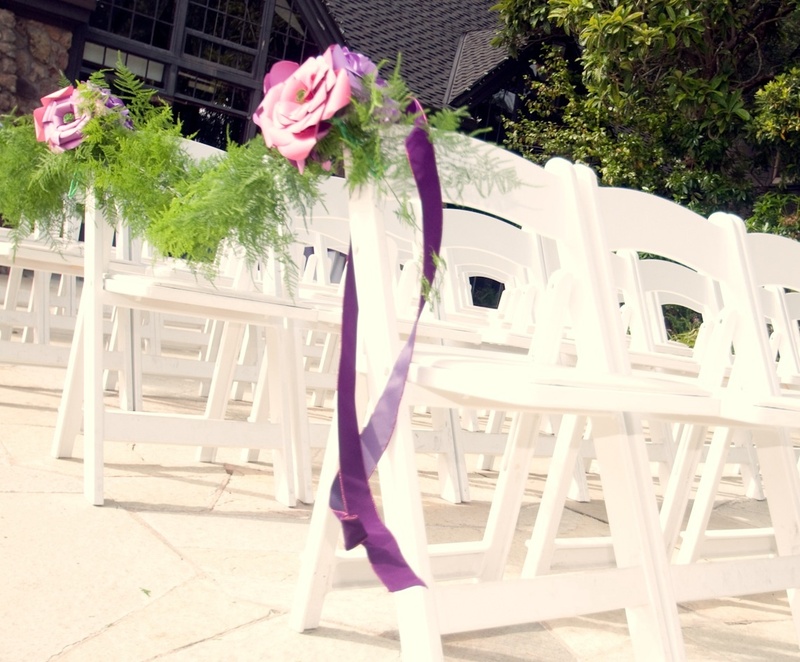 I offered to help provide floral decor for the service and reception. Since my husband, my mother in law and myself are local and organic enthusiasts.... and in keeping with my business ethic from Gorgeous and Green, I collected flowers from a few local friends' gardens in Boise. My mother in law has a friend who has a beautiful garden in her back yard featuring low-water plants and edibles. She also has a giant dog, who is also fond of the beautiful garden. From her garden I collected onion flowers, grasses, yarrow, beards, chamomile and sweet peas. We were also allowed to collect and take home tons of fresh raspberries from her vines. Lovely. Memorial services are bittersweet, and although there is a lot of sadness, it was a beautiful time to get together with family and friends and offer support. 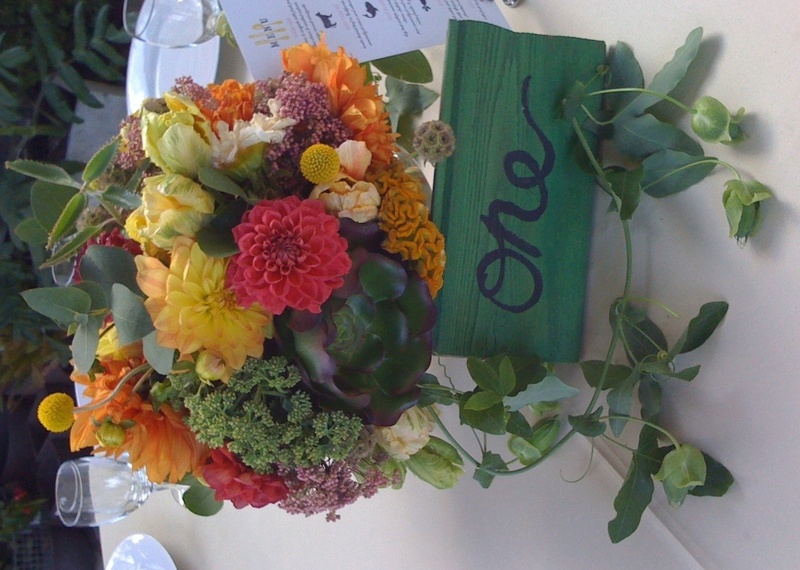 This summer I provided the floral decor for a wedding at a ranch on Mt Diablo called Diablo Ranch, a rustic and very cow and cowboy location in the East Bay. 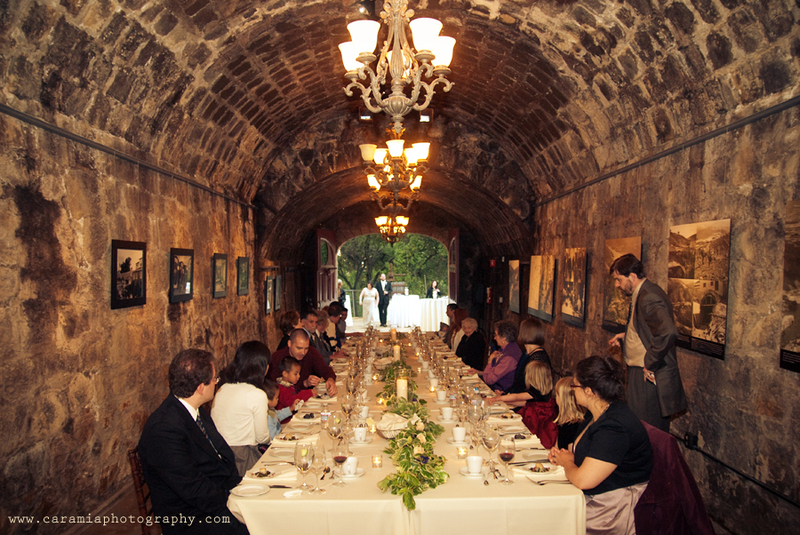 The bride really was the design force behind the tablescapes and style. 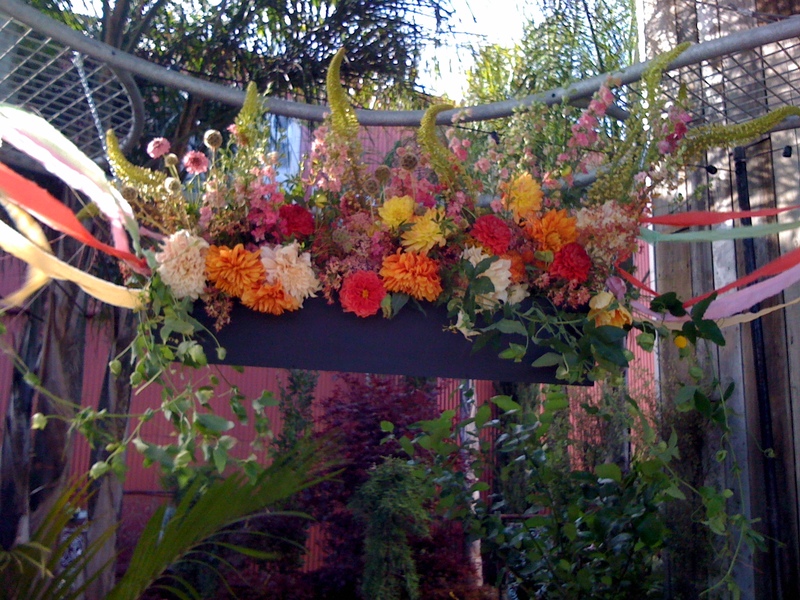 Gorgeous and Green's take on bright, natural, eclectic and exuberant plant and flower life was a great match. With collected items from both her and my collection of vintage silver pieces and china, all the containers were reused vintage pieces that gave her tables a bohemian and bright version of Miss Havisham. (something named right away during our conversation about the wedding since I'm a fan of the book: Great Expectations) I used locally grown flowers, a lot of dahlias, celosia, passion flower, scabiosa flowers, lupine, sweet william and other flowers. The colors were a stunning mix of reds, pinks, oranges and plenty of greens. Here's more lovely pictures from the beautiful and green wedding at Flora Grubb Gardens that Gorgeous and Green participated in late July. There was a great crew at the event including the wedding planner Vera Devera, the cake baker Alison Okabayashi and the photographer Stephen Hughes. 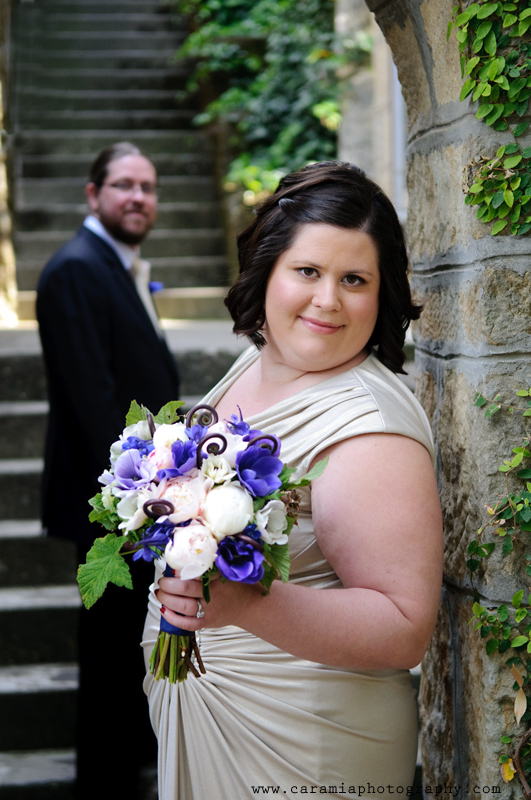 Here are some of pictures by Stephen Hughes Photograhy that show some of the vivid color, life and romance of that day. The wedding turned out beautifully thanks to some great partners in crime. Thanks Stephen for the beautiful pics! 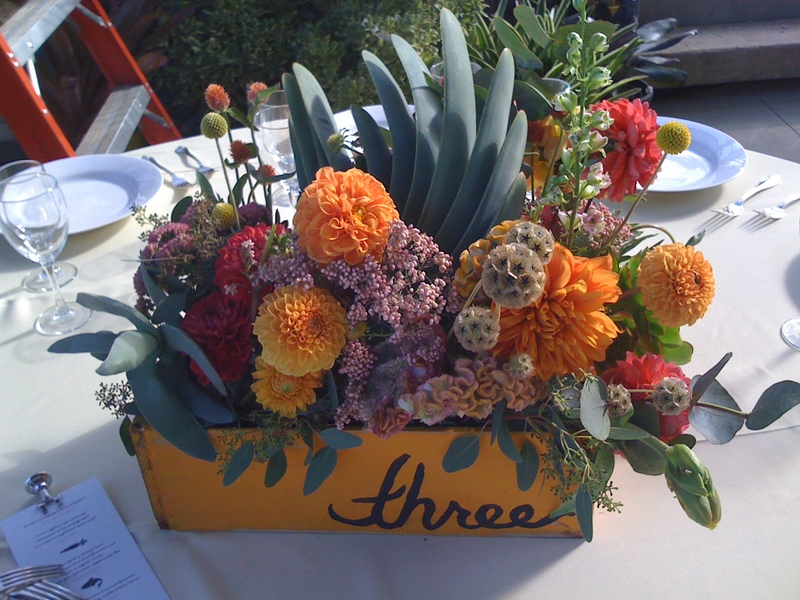 Blog by Pilar Zuniga, owner of Gorgeous and Green, a sustainable gift and floral boutique in Berkeley. 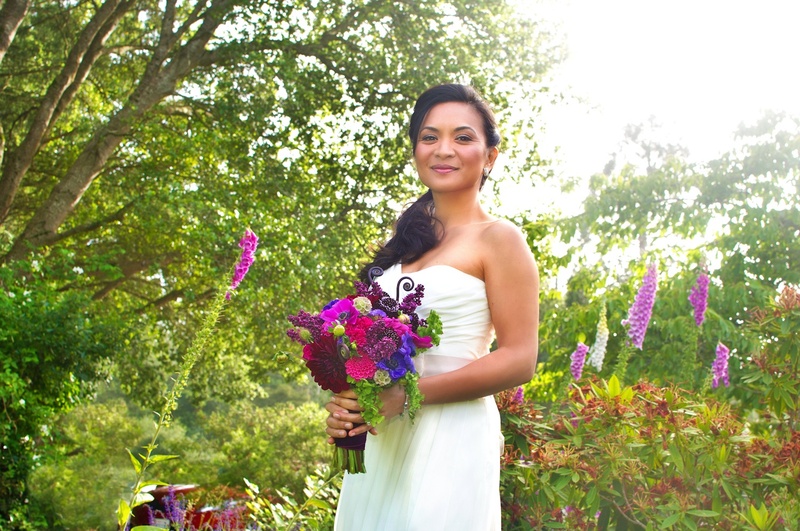 Pilar specializes in using locally grown and sustainably grown flowers and greens in floral displays for weddings, events, restaurants, offices, gift and home use. The Gorgeous and Green boutique offers an array of local and sustainable gifts, jewelry, cards and local and sustainable or organic flowers. Recently I was approached by Ceremony magazine to do a tabletop design for their new Bay Area magazine. They have a beautiful wedding magazine in southern California, and are launching one up here. Gorgeous and Green finally fit the shoot into our busy schedule and were able to make something happen this week! Here are some sneak peak shots of the table decor my assistant Ryan and I came up with. I collect a lot of vintage glass and items, both for the boutique and for my personal use. I am also a big fan of the show Madmen, so as you can imagine, the two mingled together to form this table design. Not only was it super cute, but very green. Local and unsprayed flowers and greens. Even my vintage purse made it into the picture! Using vintage luggage in muted jewel and primary colors as well as a lot of vintage glassware, the scheme came out very mad men-esque and playful. I even included a vintage typewriter and some cigars that I asked Ryan to make especially for the shoot. They are just for looks of course. 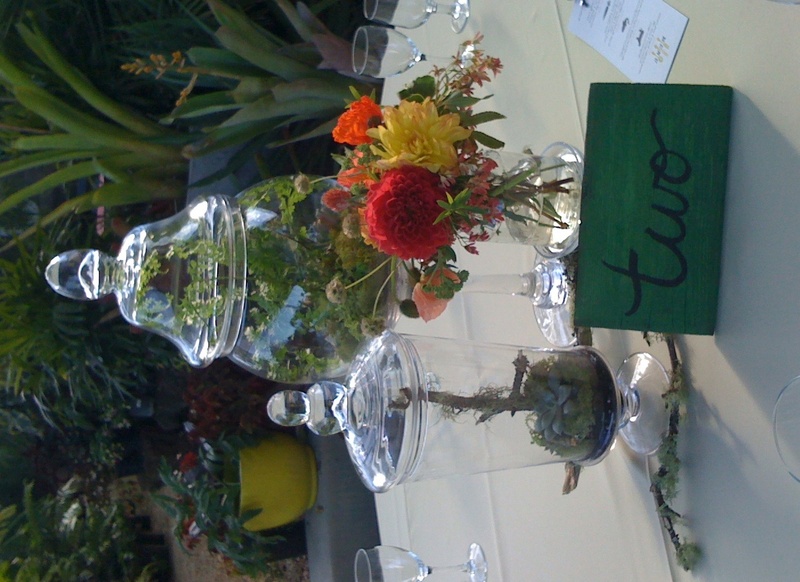 Earlier this year Gorgeous and Green helped a bride and her savvy friends decorate a sustainable wedding at the Brazil Room in Tilden Park. They had a small budget, so many of the sustainable elements were also budget friendly as well. 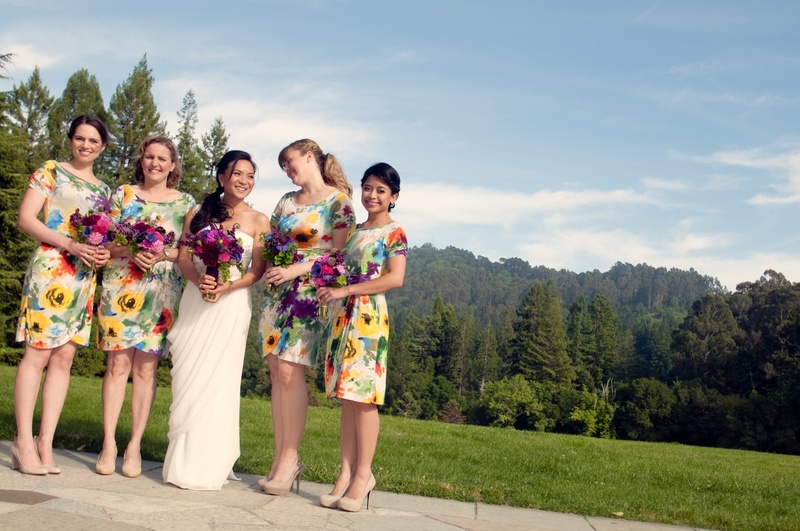 She chose a floral print dress for the bridesmaids that they thought they could wear again. An important thing to think about when you are choosing dresses. The colors were dark jewel tones in the purples, pinks and blues. 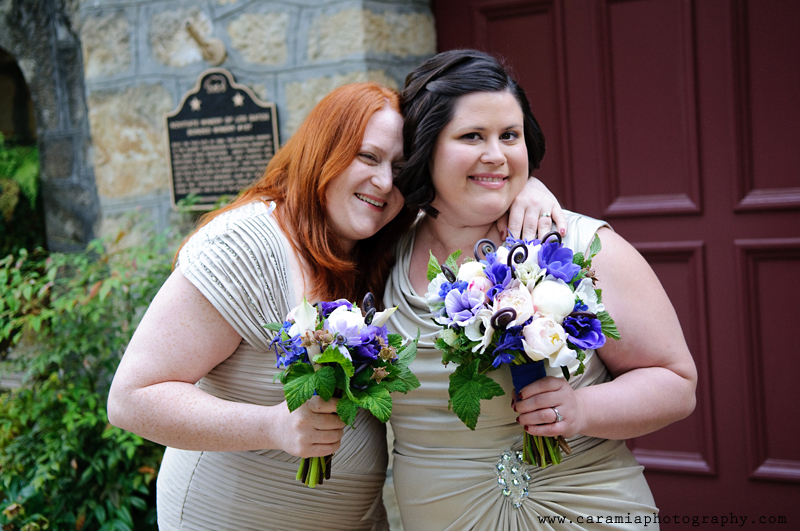 I used a lot of local scabiosa and amaranth, as well as local anemones, dahlias and celosia. A good friend of the bride made some paper flowers to use in the decor and I attached those to a fern garland I lined the aisle with. 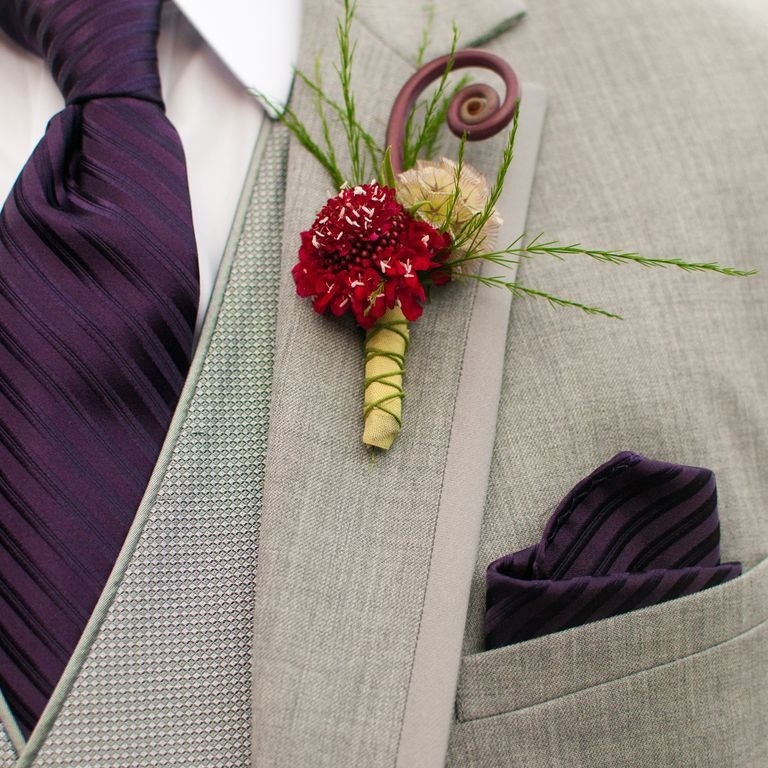 Even the boutonnieres were delicate jewels with both local scabiosa flowers and pods.